Starting in 1920, over time Frank Legg was to provide four motor bus services from his home village of Evershot, Dorset. Previously the village had been served by horse drawn carriers. Born in 1882 Legg farmed in a small way and saw that he, like other farmers, had a need for transport. So as well as running buses the firm were also haulage contractors, and this side of the business was to continue for some years after they stopped running their buses in October 1954. The bus services commenced in August 1920 with a Selden 20-seater bus working the routes to Yeovil via Melbury on Mondays and Fridays and to Dorchester via Cattistock on Wednesdays and Saturdays. This Dorchester operation entirely covered the route of Pearce from Cattistock to Dorchester, but it is believed relations were cordial despite this. 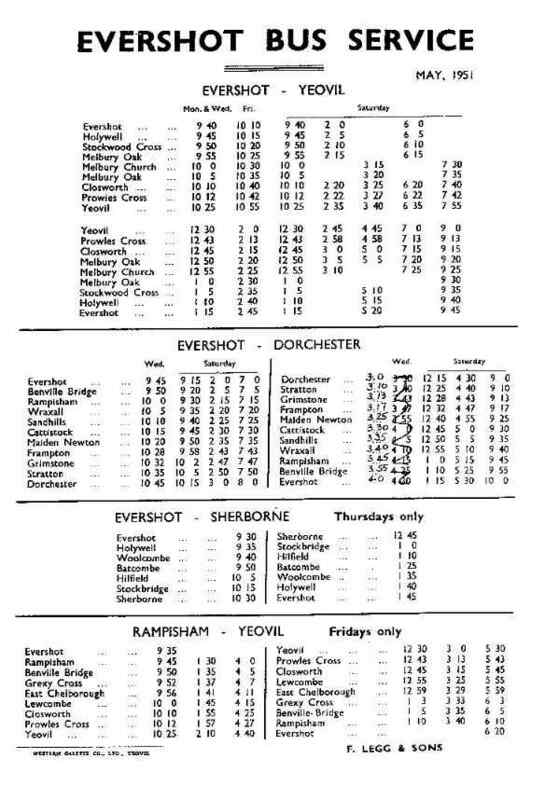 The firm was also licenced for excursions and tours from Evershot, Benville, Rampisham and Melbury. The Friday only service to Yeovil from Rampisham via Chelborough and Closworth was added in 1927. Parcels as well as passengers were carried on the buses, and the firm expanded when Frank's two sons Bert and Kenneth joined their father in the business. The Thursday route from Evershot to Sherborne, twisting through the lanes, was a post war addition started in February 1946. The number of passenger vehicles in the fleet never increased beyond three at any one time - more often only two buses were owned simultaneously - but the following vehicles were purchased as the years went by. Firstly a Chevrolet 14-seater PR5231 was bought in 1925, to work alongside the original Selden and double the fleet size, but this proved unreliable and was itself soon replaced by a Dennis 14-seater PR7443 after only a year. Next a Star 20-seater TK1056 replaced the first Selden in 1928. Lorries and vans were being added to the haulage side of the business as well. These buses were followed next by a Dennis Ace BLT826, also a 20-seater, in 1936; and then came a 1934 Commer, YD9487, from Wakes of Sparkford in 1939. EVERSHOT is a parish with railway station, 135¾ miles from London by rail, 7 east-by-north from Beaminster, 12 north-east from Bridport, 12 miles from Sherborne and 13 north-west from Dorchester, in the Western division of the county, hundred of Tollerford, rural district of Beaminster, county court district of Bridport, rural deanery of Cerne, archdeaconry of Sherborne and diocese of Salisbury. The Weymouth branch of the Great Western railway passes near the borders of this parish, and the Evershot station is 1½ miles east from the village, at a place called Holywell, but within the parish of Frome St Quintin. A fine stream called "St. John's Spring" rises here, and forms one of the principal tributaries of the river Frome. Electricity is available. The church of St. Osmund, restored, with the exception of the tower and chancel in 1853, is of Forest marble, with dressings of Ham Hill stone, in the Gothic style of the Early 15th century, and consists of chancel, nave of three bays, aisles, south porch, and a western tower, containing a clock and six bells: the east window and other stained windows are memorials: there is a memorial tablet to the men connected with the parish who fell in the Great War, 1914–18. There is a Gospel hall. The Earl of Ilchester O.B.E. (vice-lieut.) is lord of the manor and the principal landowner. The soil is chalk and sand; subsoil, chalk and sand. The land is mainly pasture. The area is 1,569 acres; population in 1931 was 295. Railway Station, Holywell. Police Station. War intervened, bringing its own problems. Evacuees swelled the passenger numbers in this quiet corner of Dorset. Larger vehicles followed, starting with a Bedford OWB / Duple utility 32-seater BFX482 bought new in 1944. At this time the Commer, well past the first flush of youth and increasingly unreliable, passed to Fred Terrell of Sydling St Nicholas for his twice weekly runs to Dorchester. 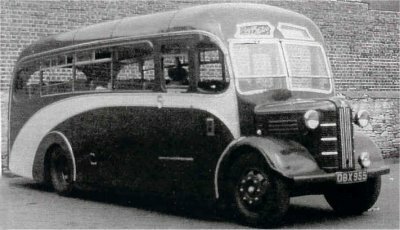 A new Bedford OB / Mulliner 31-seater CTK548 arrived in 1948 to replace the Dennis Ace and finally a second hand Austin CXB / Plaxton 30-seater coach DBX955 in 1950; this replaced the utility Bedford BFX482 which went a few miles south to Pearces at Cattistock, who subsequently had it rebodied. Thus these two vehicles CTK548 and DBX955 formed the operational fleet until Legg's bus services and the two vehicles were acquired by local operator A Pearce & Co of Cattistock. Legg last operated his bus routes on 31st October 1954. But Bert and Ken Legg continued with the haulage business until 1972 when they retired from running their four lorries (mainly as livestock hauliers). Frank died in 1962 at the age of 80, and lies in Evershot churchyard together with his wife Mabel Annie. Of the two sons Kenneth died in 1981, aged 70 and Bert died in 2003 at the grand old age of 96 years.